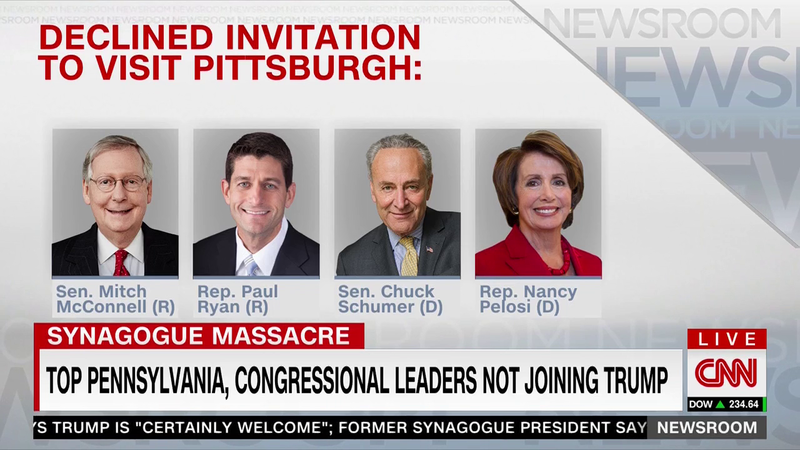 Congressional leaders from both parties along with much of the local leadership have turned down an invitation from the White House to travel to Pittsburgh following the massacre at a synagogue over the weekend. The White House asked the top four congressional leaders — House Speaker Paul D. Ryan (R-Wis.), House Minority Leader Nancy Pelosi (D-Calif.), Senate Majority Leader Mitch McConnell (R-Ky.) and Senate Minority Leader Charles E. Schumer (D-N.Y.) — to accompany Trump and first lady Melania Trump to Pittsburgh but all declined, according to three officials familiar with the invitations. An aide to McConnell, who on Monday denounced the shootings as “hate crimes,” said he was “unable to attend today” on Trump’s visit to Pittsburgh, where 11 people were gunned down Saturday at Tree of Life synagogue. A spokeswoman for Ryan said the speaker wasn’t able to make the trip on the short notice. None of them should be going, but apparently, that won't stop House Majority Whip Steve Scalise (R-La.) from joining him.